Once you’ve fallen in love with your perfect piece, we won’t let anything stop you from bringing it home. Choose from a wide array of exclusive no money down financing options with your Signature Plus credit Card. Plus, with our lease to own option through AcceptanceNOW you can shop with confidence. You simply make affordable monthly payments that fit your budget with no long term obligation and no credit is needed. Love it, protect it with Pure Promise. Our 5-year, worry-free protection plan that covers stains, accidents, and structural damage to fabric, leather, and wood pieces. Because, let's face it — life happens. If you don’t use it, you get the full amount back in the form of a store credit. "My husband and I purchased our bed after we got married and bought our first house last fall, that bed continues to be my favorite piece of furniture we have ever bought." Hassle free delivery right to your front door. Plus you can track the progress of your delivery online, so you'll know exactly when your perfect piece will arrive. Of course, if you do have a truck we can always arrange for free local pick up. You have a vision for your home and we're here to help you achieve that vision, it's our promise to you. Since 1948, we have been helping families fill their homes with furniture they love. 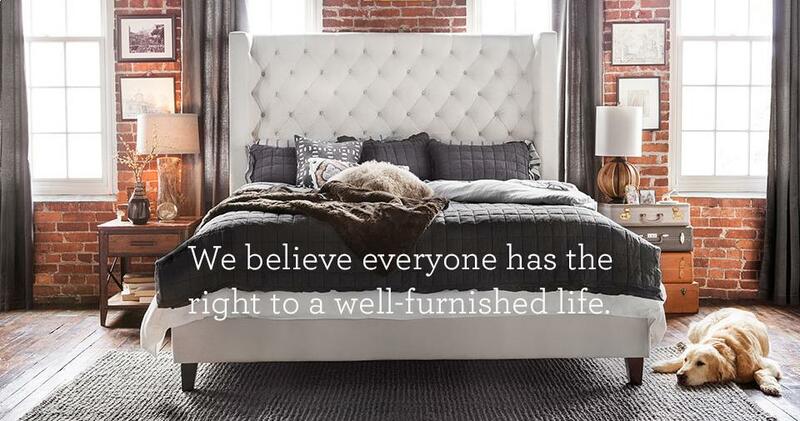 We believe everyone has the right to a well-furnished life. Making this possible for our customers is what we do – each and every one of us – every day. We are a part of a family of furniture companies that includes more than 100 family-owned and operated stores. Our mission is to make furniture shopping easy and to help customers like you find the perfect furniture. The furniture that sets the scene for life from your first apartment to an empty nest and every laugh, smile, and dream in between… the furniture that is your perfect piece. "For more than 60 years, we’ve helped our customers turn their houses into homes, one perfect piece at a time."